What did I take away from the 1964-1965 World’s Fair in Flushing Meadows, Queens? Well, I was eight years old. I don’t remember much from back then. What I do remember are impressions. The Beatles on transistor radios everywhere. The waffles and ice cream. I had an orange hat with a feather on it. Fountains with dancing water everywhere. An animatronic Abe Lincoln. Hushed silence at the Pieta exhibit. My uncle and aunt, who were visiting from California, fetched me away from school one day and we rode to Flushing in their car (I had rarely been in a car at that point and I still rarely am). 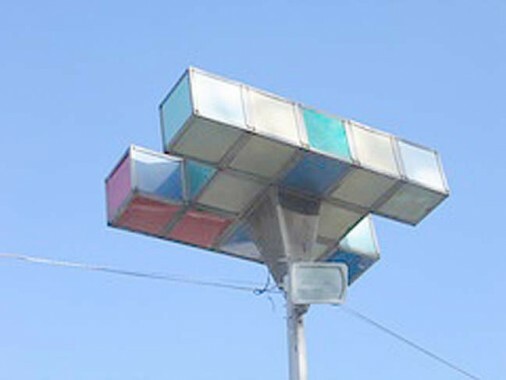 A relatively mundane square, with 8 bulbs in a 3-2-3 pattern. An uneven configuration, arranged in a 2-4-2 pattern. H-shaped, in a 5-2-5 pattern. Like a Z, in 3-2-3. The reverse of the above 2-4-2, this is a 4-2-4. Possibly my favorite arrangement, 1-3-4-3-1. The last one in my collection, 5-2-3, though there were probably more patterns. 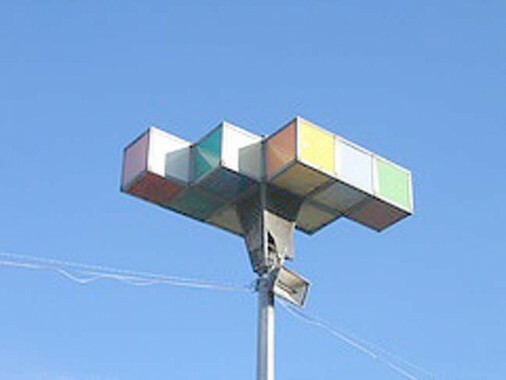 When I first encountered the Rubik’s Cube in 1982, which I always found impossible to solve (ditto Sudoku, or any similar number puzzles) I immediately thought of these World’s fair lamps. 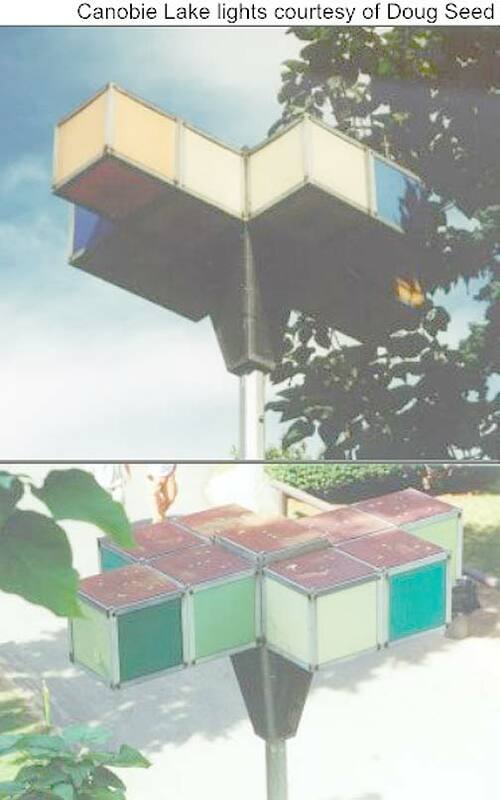 It turns out that the cube toy was invented in 1970, by a Hungarian scientist, and he’s still alive — so If I ever found myself in an elevator with him I’d know what to ask. Here’s a few “Worldies,” or so I’ll call them, in front of the General Motors exhibit. Some Worldies lining a lengthy corridor. What’s that exhibit in the distance? A square configuration Worldie in front of the Chrysler Motors “Engineering Island” exhibit. I’m not sure where this is, but the Fair was open between April and October in 1964-65, so snow would likely not be part of the scene. I also recall a pair at the entrance to Astroland in Coney Island in the 1960s, but of course they are, as well, deceased. Unfortunately, the Worldies’ design didn’t become standard anyplace I’ve visited since. The Orange County Fairground in Middletown, NY has a lot of Worldies — and apparently the set I have, from Jean Siegel, was part of this cache. And, seek and thou shalt find. Here is a diagram showing all Worldies configurations. * touch tone telephones were installed on all the public pay phones. * National Cash Register had a computer hooked up to a printer (how futuristic) that would print out things that happened on a particular day on the calendar (you were asked to type in your birthday). * the new blue and white R33-R36 IRT cars on the #7 Line, which morphed into the redbirds and lasted until 1993. On a visit to Disneyland in the Spring of 1964, there was a Picturephone setup between the Bell System Circarama foyer in Anaheim and the New York World’s Fair. There was a huge line of people waiting to talk–so I never got a chance. Anyone remember where the Picturephone was located at the New York end? All we knew at Disneyland was the rather generic locale of the Fair itself. Four exhibits from the Fair transferred to Disneyland after the Fair closed–The Carousel of Progress (RIP), It’s a Small World, Great Moments with Mr. Lincoln, and the Dinosaurs. I know there are things like video messaging now, but picturephone failed because you’re often on the phone when you are not looking your best, maybe just out of bed, or home from an evening’s drunk. Picturephone would have done better at work, where presumably people are spiffed up in a business setting. I know they had a PicturePhone setup, but what I recall was another Bell Telephone innovation – though it was essentially what we now know as a conference call on speaker. Several people sat in a round-roofed “booth” where you could make a call and speak without any handsets, and the voice seemingly came out of the walls and ceiling. I was 9, but my whole family thought it was amazing at the time. I think the location of the Picturephone at the NY Fair was called the “Bell System” pavillion. As I remember, it also had an exhibit of a voice distortion device that made your voice sound like someone else (the kind of thing shows like 60 Minutes now use to disguise people’s voices), and also of voiceprint identification. (I’m not sure if these were combined, with the voiceprints identifying people despite the deliberate distortion. Probably not.) Also talk about the benefits of the new Touch-Tone technology most saw for the first time at the fair, and of their new electronic switching system (ESS) exchanges. I recall seeing a few at a restaurant in Connecticut near New haven off I-95. This was about 20-30 years ago I think. I am pretty sure they are gone, but when I saw them as we were driving by I was like, “wait a minute, aren’t those…). I never went back to check them out but they were the WF lights, for sure. No mistaking them. Middletown NY is a couple or so hours from the City by car. There are drawings of where the lights were placed, etc. from sheets 16 – 21. Now if someone can can only figure out what type of Worldie went where or knows where to find that info, it would be great to see. Enjoy! Thanks for those — looks like my batch came from those Orange County fair page. Please check the April edition of “Hemmings Classic Cars” wherein you will see a photo of the Greyhound Escorter, which was a large golf cart. Hemmings has tried to locate any surviving examples & has determined that 3 survive. 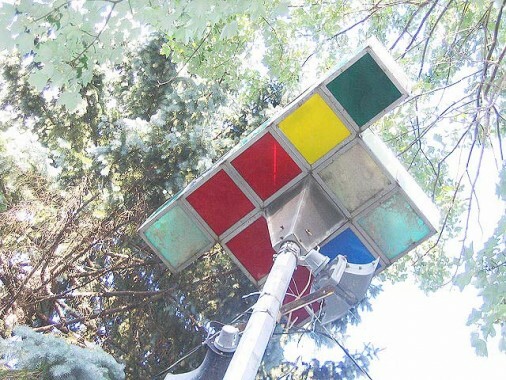 At least one was restored & it’s owner hopes to return it to Flushing Meadows in 2014 for the 50th anniversay of the 1964 World’s Fair. During the fair when it ran in 1964-65, I was not a resident of NYC. I was living in North Carolina, but was up here during summer vacation for both years. The exhibit I remember the most was the NYC Panorama. To see it from all angles now, one has to walk around the model. During the fair, I remember those little cars that ran around the perimeter of the exhibit to let you see it at different angles. Also, when I attended the fair in 1964, I remember that “Where Did Our Love Go” by the Supremes was a popular record at that time. The attraction was intended to simulate a ride around NYC by helicopter. Today you had can take a leisurely stroll and stop when you wish. I rode it then and walk it now. I prefer today’s option. There are also two improvements to note. First, the Rockaways did not fit when the Panorama was installed in 1964, so it was exhibited by itself in “no man’s land”. It is now properly positioned where it is attached to the rest off NYC. The other is that the Panorama is regularly updated so that it is a model of what the City is now, not a captured image of some past era. 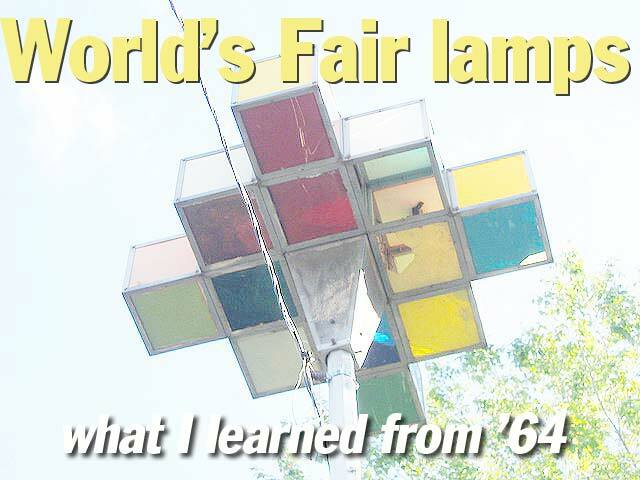 For at least two or three years after the fair, there was a lot just west of the fairgrounds and next to the LIE with hundreds of uprooted lamps available for purchase. As a 12-year-old I really wanted to buy one, but couldn’t figure out a way to fit it into my family’s apartment in Middle Village. Living by Roosevelt Ave & 75th St, we snuck in, I mean attended, the Worlds Fair dozens of times in the 2 years it ran. I was 15 & 16. 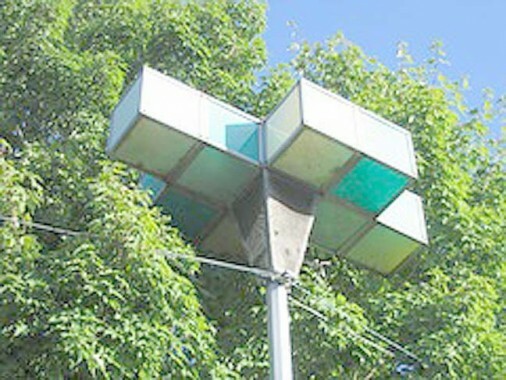 I always thought those lampposts were so cool! I grew up in Corona and lived on Corona Avenue just east of Junction Blvd. I also snuck into the fair about 50 times each season! I am curious if you remember where you snuck in from? Our best one was near the Eastern Airlines exhibit. We would jump the fence behind a Brass Rail stand, and go around the corner right into the bathroom. I only remember getting caught once in all of my attempts. Oh, the good ol’ days! Does anyone remember the Auto Thrill Show at the fair? I remember this most of all and I’ve never met anyone who remembered it or attended it. It was great! I lived a few blocks from the Corona side of the Fair, and I visited it almost every day. I remember viewing the Auto Thrill Show once. I collected much memorabilia when the fair was operational, and also after it closed. I had about a dozen of the orange license plates that said “New York World’s Fair – See Dodge Auto Thrill Show”. I still have a couple of them hanging on the wall in my garage. Did they introduce the Amana Radarrange at the World’s Fair…I can remember something like the microwave where your food cooked super fat. I also remember I think it was Sperry Univac where you told them your favorite number and the computer produced a printout where the numbers in the matrix totaled your favorite number. Also loved the NYS pavilion…the map and that fantastic movie. I was 5 years old when my parents took me and my older sister to the fair. The only memory I have of it was going on the “It’s a small World” ride. I can still remember being in the boat, the thrill of all the animation and the song. Anything else about the fair was unfortunately not retained by my young mind. Oh well! I remember the Belgian Waffles, and I never even tasted one. We used to sneak in at holes in the fence under the Van Wyck. Futurama made a big impression, as did GE, Ford, Bell, DuPont, IBM… I was 9 and 10, lived about a mile from the Fair in Queensboro Hill. I remember the Auto Thrill show during 1965 when it was sparsely attended. Had a friend with stacks of admission tickets and he would go 3 times a week just for waffles with strawberries and vanilla ice cream. I mostly recall going with several recently discharged Air Force pals and drinking beer by the Steins served by German girls in the outdoor beer garden. One of the original model one picture phone units went for over 21,000 dollars on eBay about a month ago. 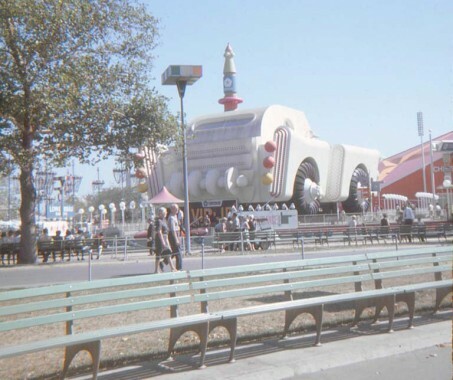 Though i have the slides and eight millimeter footage my dad took of me at the fair i have very little memories of it since i was only three years old. The only thing that i can recall was the its a small world ride. Infact i know that i still have the 45 recording of the song at my mothers apartment. A collectors item now for sure. My favorites were the NY Pavilion and the Sinclair Dinasaur. 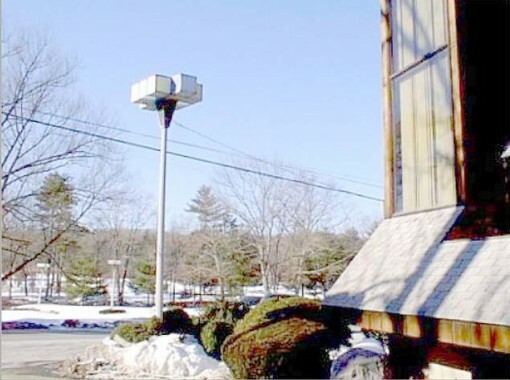 I recall seeing some Worldie lampposts in the Poconos at one of the resorts….Penn Hills….about 15 yrs ago. 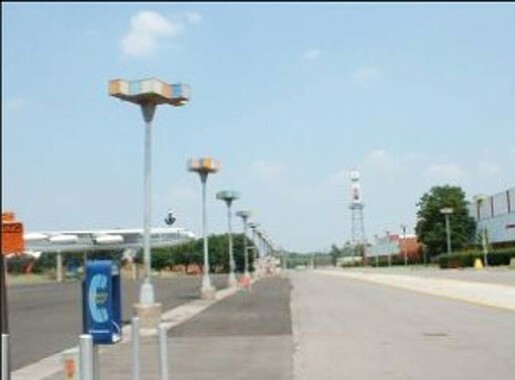 Confirmed on the Internet along with other ’64 Fair remnants in 2003. As we drove by the place I did a double take and also thought those were from the ’64 Fair. Wouldn’t mind having one now lighting up my front walk…. The worldies were still at Penn Hills as of last summer, though the resort is now closed and abandoned. I have many memories from the fair as I was 15 and 16. The one that stands out are a lot of walking and standing on a lot of lines for an hour each. We walked because the tram cost 25 cents per person and each time you got on it was another quarter. Remember the subway fare was only 15 cents. So if you used the tram all day one person could easily spend $3, equal to about $50 in today’s money. Way over priced. 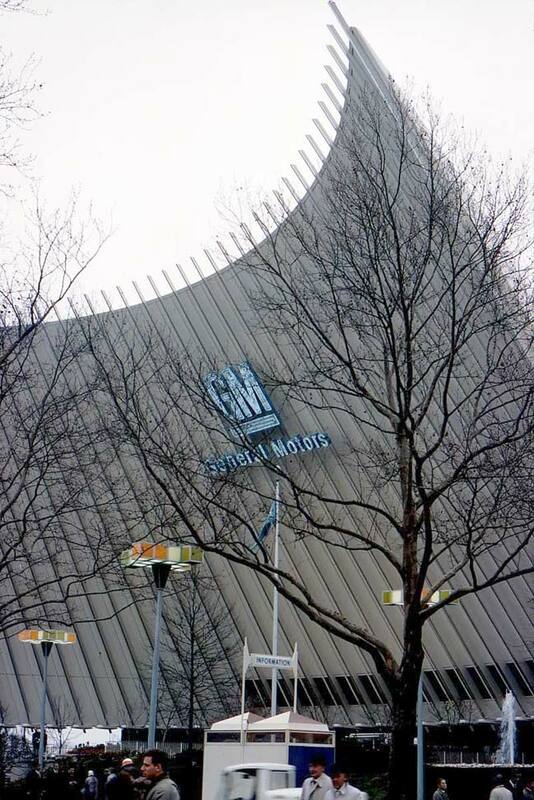 I remember the “car of the future” at the GM Pavillion and thought that all cars would look like that. Well, one did. It was the American Motors Pacer that came out six years later. I remember waiting an hour at the NCR Pavillion just to find out who was born on my birthday. When, I turned to my friend, I said to him well at least you now know who was born on my birthday. With sad dejected eyes, he looked at me and said, “No, I don’t. I mistakenly typed in the wrong date.” We didn’t want to wait another hour so he could correct his mistake. It also was the first time seeing carbonless carbon paper. Wow. It seemed like magic. We couldn’t figure out how it worked. Soon it was everywhere where the first sheet was white, the second, yellow and the third, pink. Funny, the country pavillions were the least memorable thing about the fair, except for the Belgian waffles. I was 11 in 64 and my mom worked there. Oh If only I could get one of those, any condition. There is one for sale on ebay! 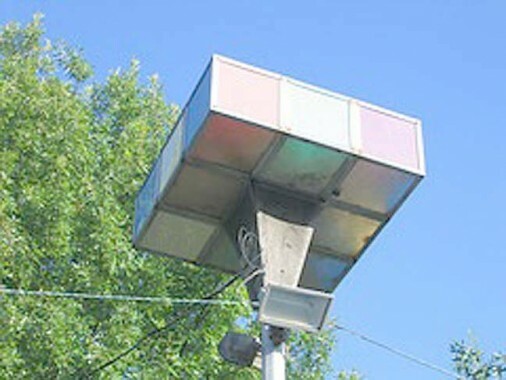 64 Worlds Fair Luminaire Light! I went to the worlds fair when I was 5. 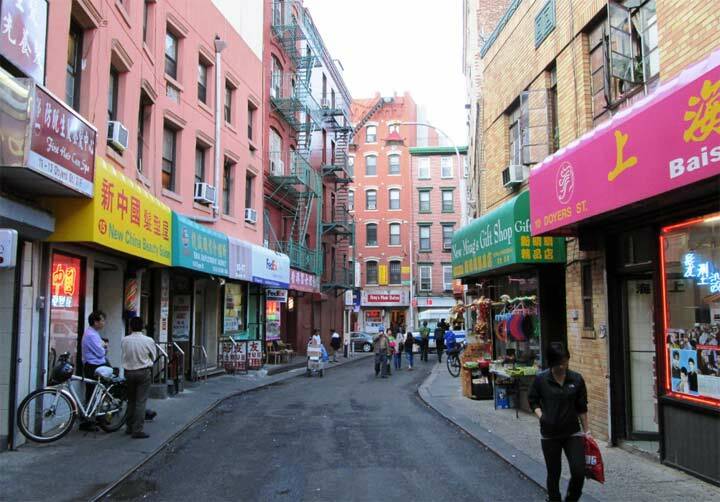 Lived in Flushing at the time. Those lights made a big impression on me, for some reason. 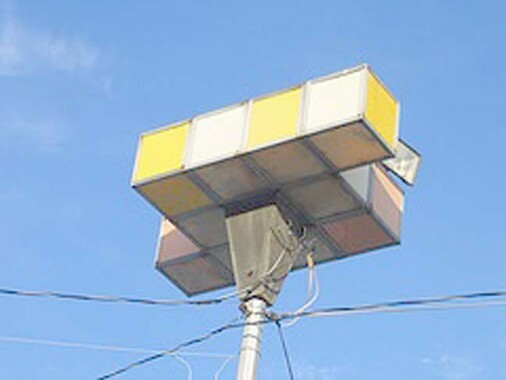 I still remember the pang of nostalgia and bit of head swimming disbelief 18 years later when, on my day off from working on oil wells in Oklahoma and Texas, I went to a Friday night fish fry at the Oklahoma City fairgrounds and there were some of those beautiful Luminaires along the road. Brought back many happy memories. I used to go to Canobie Lake Park in NH all the time as a kid and ended up working there during summers in high school. Always loved the lamps — the colors and the different cube arrangements. Had no idea they came from the Worlds Fair. For the record, they are still in active use at Canobie athroughout the park. If it interests you, now being Dec 2015 I am selling individual refurbished NY Worlds Fair cubes and taking orders on full refurbished lamps. Search Ebay for them. Peace through understanding!